While iMovR's Lander Desk may never have been designed for the DIY market, its overwhelming success has led to increased demand, and the creation of this DIY kit. The Lander base is simply the best DIY standing desk base available, with all of the features that set the Lander Desk apart: smartphone compatibility, an easy-to-use paddle controller, incredible stability, and ease of assembly (yes, even for the DIY version). Boxed Dimensions: 32" x 28" x 10"
Optional Crossbar Dimensions: 47" x 6" x 3"
Intuitive paddle-style controller is a joy to use. App-compatibility leads to two key benefits: you can move your desk with one tap (while also adhering to UL certifications) and you gain access to optional push-notification reminders. Incredible stability, outstanding 10-year warranty. Easiest DIY desk assembly we've ever done. While there are no negatives with the product itself, the price tag will likely deter some from seeking the top-of-the-line Lander as their DIY standing desk base of choice. If there's a better DIY standing desk available to the consumer market, we have yet to find it. The Lander is a home run on features (app compatibility, one-touch height adjustment, advanced collision detection), build quality (incredible stability backed up by a 10-year warranty), and ease of assembly. iMovR's Lander Desk is a class-leader that anyone interested in DIY standing desks should be aware of. Of course, it's also a couple hundred dollars more expensive than its closest competitors. iMovR customers now have the choice of this new Lander standalone electric base or the lower-priced iMovR Freedom or iMovR Vigor bases (see below). In all deference to Oldsmobile, electric standing desk frames have only been around for a decade, so if your grandpappy had one he was probably retired when he got his first sit-to-stand desk. Until now, DIY standing desk frame kits pretty much all looked the same and worked in the same way. You attach the lifting columns to the cross bars, attach a foot to each leg, attach the power supply and hand controller to the desktop, connect all the cables and off you go. On average, it takes about one hour to assemble the desk base and screw your desktop to it, assuming you have the right tools and aren’t intimidated by Allen wrenches. Differences between conventional DIY electric bases are mostly a matter of lifting column performance (lift capacity, transit speed), sophistication and aesthetics of the hand controller, and stability of the overall frame. Variations in manufacturing quality abound, with a clear distinction between Chinese-made (from crappy to good), Taiwanese-made (very good) and European or USA-made (highest quality and tightest precision tolerances). The Lander base changes the paradigm somewhat because it was originally designed for iMovR to be able to ship complete standing desks, with the frame components already attached to the 3D-laminated or real-wood tops at the factory. So the sequence of assembly has changed from building the entire base before attaching it to the top to now attaching the frame pieces and hand controller to the desktop first and then simply plugging the factory pre-assembled legs (lifting columns with feet already attached) into the frame. That last part requires no tools, no skills, and shaves your assembly time at least in half, if not more. Let’s start with the lifting columns, since at the end of the day, they are what matters most. The Lander’s lifters are the most advanced ones made today, based on Linak DL-6 linear actuators. Highly precise, brawny (365 lb lift capacity), fast (1.6 inches per second transit speed), and remarkably quiet, these come with a ten year factory warranty—they’re that good. The Linak linear actuators are also known for having the best available anti-collision technology. Indeed they performed better at backing off from chair arms, file cabinets and other obstacles than any other desk frames we’ve ever tested—including all DIY as well as full production desks. The Lander's signature paddle-style controller—tap it up or down to move your desktop. But the technology really blows your mind when you get to the hand controller. Actually, it’s more of a high-tech “height control paddle” than a confusing cluster of membrane switch buttons. The beautiful hi-res, color display elements stand in a class of their own versus the red or green LED or low-contrast LCD readouts found on most other sit-stand desks. Changing from sitting to standing is simply a matter of double-tapping the height control paddle upwards or downwards. No more digging around for the right button and holding it down until the desk reaches its destination height. (As a side note, be sure not to screw the paddle in too tightly when you're installing it, or you won't be able to move it up or down. If you do screw it in too tightly, you can simply loosen the screws until the paddle is movable). The Lander desk is the first USA-made standing desk that has fire-and-forget height change capability AND still retains UL certification, and that’s one of the many benefits of its Bluetooth sync to your smartphone. On the smartphone app you can do all the obvious things like keep your own height preferences stored (up to four per user) and set your health coach notification timing (read below), but you can also check the click-wrap liability waiver to allow a simple double-tap on the paddle to command the next to the next highest or lowest height preset. One really cool thing about the Bluetooth sync is that if you’re going to be sharing your desk with one or more other people, your height settings and other preferences come with you every time you re-approach the desk, re-personalizing it to your settings each time. Standing Desks are meant to Stand – Dang it! So often we hear “oh, I have a standing desk, but I get so busy I forget to use it”. It’s like leaving an ocean vessel docked in port… a crying shame. We always advise our readers to at least leave their desks at standing height at the end of their workday so that they’re biased to stand, not sit, first thing in the morning. In the coolest feature we’ve seen on any standing desk—yet immensely practical—the Lander will actually remind you to stand, and gently so, at intervals that you set through the app or through the discretely hidden buttons on the paddle. You’ll get a push notification to your phone and/or notice the blinking color lights on the height paddle’s display whenever it’s time to get up. A recent study conducted in Denmark demonstrated a 117% increase in standing time when users' desks were enabled with Lander's built-in health coach. Right now the app provided with the Lander for iOS and Android is fairly simple but we hear that many more features will be added in the future, like sync’ing to your personal wearable devices. Fortunately app updates are free, you’ll never have to change your desk hardware to take advantage of new software features as they’re rolled out in the future. Crossbar version pictured. The version without the crossbar still features the metal sockets into which the legs are inserted. All linear actuators have some “deflection,” typically 1 to 1.5 degrees of it, which will create some instability in the desk as you near the top end of its height adjustment range. This is because the overlapping area at the ends of the telescoping tube segments start to get small. This is inherent in all standing desks. 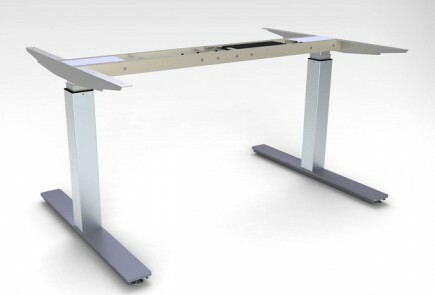 A quality standing desk should not need a “stability bar,” or cleverly named “artisan bar” as one vendor calls it, connected between the two bottom tubes. A quality desk base, and the iMovR bases are no exception, will have more than sufficient stability with the crossbar running between the legs’ motor housings, right along the underside of the desktop. This way the desktop lumber itself provides some added rigidity to the frame, and aesthetically it’s a lot nicer than seeing a “shin crusher” bar running between the legs about a foot off the ground. If you’re not exceptionally tall or aren’t using a very wide tabletop you probably don’t need a crossbar, and you can save the $50 when you buy your Lander Base kit (the crossbar is not an optional component with most DIY bases). But if your desktop is five feet or wider then you’re probably going to want this metal reinforcement to maximize the stability of your desk. Among their many unique attributes all iMovR electric standing desks reach up to 49-51” in max height, as they have long catered to taller individuals. This is already 3” higher than ANSI/BIFMA certification requires. But iMovR also specializes is treadmill desks, so to accommodate tall users on treadmills they are the only manufacturer that offers optional 6” leg extensions. If you’re a particularly tall individual, and especially if your desktop is going to be very wide or very heavy—or if you’re concerned about your large LCD monitor(s) swaying at the end of a monitor arm— you might want to invest in these 6” extensions even if you don’t plan to ever get an under-desk treadmill, because the extra length in the bottom tube will yield greater stability for the entire desk. You can also add caster wheels for even more height, bumping the top end of the Lander’s range from 56” to 58.5”, well higher than any other standing desk will go. The Lander base comes with an industry-leading ten year warranty as well as a 100-day satisfaction guarantee. While you’ll see some Chinese-made bases like the subpar Jiecang that’s used in the Fully Jarvis and UpLift desk, come with a five, seven or even ten year warranties, these are usually offered by the retailer, not the underlying manufacturer. It’s a bit of a self-insurance game that counts on users upgrading to a new desk rather than going through the hassle of taking their desk apart to replace a failed leg, power supply or controller. Our staff experts’ advice is to always go with the higher-quality componentry of a top-shelf American, European or Taiwanese-made base and avoid the immense hassle of dealing with an out-of-commission desk altogether. Keep in mind that desks generally start to underperform before they fail, and loose manufacturing tolerances will lead to performance issues such as grease streaking, squeaking when in transit, and increasing shakiness over time. The Lander’s ten-year warranty is an actual factory warranty from the world’s largest and most respected manufacturer of linear actuators, Linak. When iMovR originally announced the Lander Desk in early 2018, they never intended to sell it standalone, since its primary feature was enabling complete factory pre-assembly of a standing desk. The DIY crowd quickly voiced demand for the base kit despite iMovR’s marketing plans, and so they have responded by releasing this all-new kit. iMovR does, however, continue to make two other electric standing desk base kits for DIY desk builders, so let’s see how these compare. 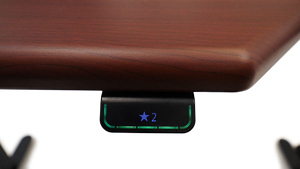 Starting at the bottom, the iMovR Freedom Standing Desk Base is the lowest-cost high-quality base made in the USA. Same precision robotic manufacturing, same 10-year warranty, but it is decidedly a no-frills option. The height controller has a simple LCD readout with two programmable height settings. Maximum desktop width is 6-feet versus the Lander’s 7-foot limit. Like the Lander, the Freedom comes in black, silver or white paint schemes. The iMovR Vigor is made in Taiwan—to the same rigorous manufacturing tolerances as an American-made base—but it has one feature that stands it apart from all other DIY bases—its 490-lb lift capacity. If you’re planning on mounting a granite top, this is the base to go with. The Vigor is also the only iMovR DIY base with a 3-leg version for L-desks. See our full review of the iMovR Vigor. We couldn’t find fault with any of the Lander’s features, but be prepared to pay for this level of technology and quality. The Lander base kit sells for $799, or $849 with the added adjustable-length crossbar, which sets it at the top of the pyramid in leading-edge features but also a couple of hundred bucks more than the next-best DIY standing desk base, the Vigor.